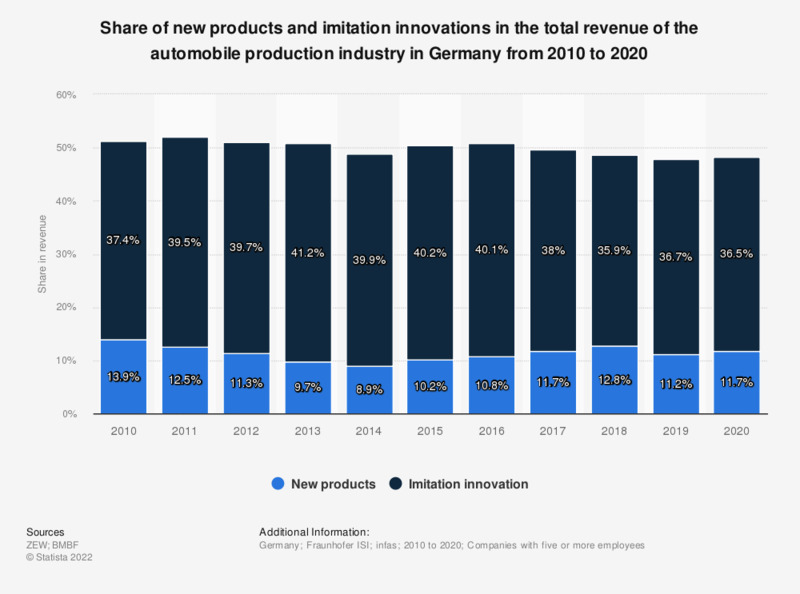 This statistic presents the share of new products and imitation innovations in the total revenue of the car production industry in Germany from 2008 to 2017. In 2017, the share of new products in the revenue of the car production industry amounted to roughly 11.7 percent, and the share of imitation innovations in the revenue amounted to roughly 38 percent. New products are defined as those which the company has introduced as the first provider on the market. Imitation innovations are new products of a company which have already been offered by other companies at the time of introduction. The German Innovation Survey is conducted on behalf of the Federal Ministry of Education and Research in Germany (BMBF) by the Centre for European Economic Research (ZEW) in Mannheim in cooperation with with the infas (Institute for Applied Social Science) and the Frauenhofer Institute for Systems and Innovation Research (ISI). The first survey was undertaken the first time in 1993. The survey aims at all companies in Germany with at least 5 employees and an economic focus from the industry groups listed on page 1. Definition and measurement concepts are derived from the international standards of the OECD and Eurostat. The Innovation Survey is part of the biannual European Community Innovation Survey which is coordinated by Eurostat. All figures are extrapolated to the total number of companies in Germany with at least 5 employees. In 2017, more than 17,200 companies took part in the innovation survey (=57 percent of the sample), among them 262 from vehicle manufacturing.